North Korea official So Myong Il introduces the rocky peaks around Mount Chilbo, North Korea. He obviously loves the beach he's on as well as the rugged, emerald Chilbo mountains that rise abruptly behind it. He loves them enough to forget, for a moment at least, that he is a senior official sent to deliver an ideology-soaked pitch singing their praises and instead lets the natural beauty surrounding him speak for itself. In this Aug. 20, 2018, photo, North Koreans enjoy the day on a seashore near Mount Chilbo, North Korea. Hotels, big and small. Tourists from all over the country, maybe the world. "As long as we have the leadership of our respected Marshal," he says, referring to leader Kim Jong Un, "our future will be bright indeed." So wouldn't think of questioning the leader, but there is a hint of apprehension in his voice. And he isn't alone. North Korea is pushing ahead with a new strategy of economic development and the intensified diplomacy with China, South Korea and the United States that such a move requires. But hopes for a better future are mixed with concern over potential downsides of political or social volatility, and something that's harder to articulate: a fear of the unknown - even if it appears far more promising than the arduous path the country has been on for decades. As Kim prepares for the 70th anniversary of North Korea's founding on Sept. 9, his ambitious development plan is being implemented, from the small-time renovation of town halls to the almost biblical-scale mobilization of "soldier-builders," who are working around the clock to turn the remote northern city of Samjiyon into yet another showcase of Pyongyang-style socialism. Economic development - and how U.S. capital and know-how could speed it along - was President Donald Trump's big carrot when he met with Kim in Singapore three months ago to try to negotiate a denuclearization deal. But Kim's diplomatic overtures aren't intended to open the door to American capitalists, a scenario that would make any good party cadre shudder. They are aimed at breaking down support for sanctions and getting the U.S. to step out of the way. Kim's game is to play China and the U.S. off each other, grab whatever concessions he can along the way and adjust his position as the situation evolves. In the meantime, lest anyone get the wrong idea, the ruling Workers' Party of Korea has begun churning out paeans to socialism in its daily newspaper along with anti-capitalism, anti-imperialism screeds that underscore North Korea's official opposition to essentially anything that might be considered the American way of life. Or, as it's known in the jargon of North Korea's propaganda machine, "the imperialists' bourgeois ideological and cultural poisoning." North Korean men chat on a seashore near Mount Chilbo, North Korea, Aug. 20, 2018. Uncertain of where it might all end up, state-run media have provided only limited coverage of Kim's meetings with Trump in June and his multiple summits with Chinese President Xi Jinping and South Korean President Moon Jae-in. Reports have portrayed Kim as the consummate statesman, firmly in charge of a carefully considered strategy to make his country safer and more prosperous. Kim is ardently wooing South Korean investment to help him build the very things Trump was offering: infrastructure, particularly roads and railways, and the development of selected tourism zones. After a high-profile chill last year, he is also actively courting Beijing, which continues to be an essential source of fuel, a key market for North Korea's coal and other natural resources and a fairly reliable check on U.S. power in the region. Pyongyang's explanation for the shift in its foreign policy has been consistent: Having successfully built a credible nuclear deterrent to U.S. aggression, Kim is reaching out to Seoul to join hands in a "for Koreans, by Koreans" effort to secure a lasting peace on the Korean Peninsula, unhindered by the meddling of foreign powers. But officials have made sure they don't have much time to ruminate on it. North Korean men prepare to barbecue duck meat on the seashore near Mount Chilbo, North Korea. Mount Chilbo, a collection of rocky peaks and a stretch of largely untouched seashore on the country's northeastern fringe, is one of North Korea's most cherished natural wonders. 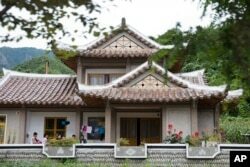 The first hotel for non-Korean visitors opened in the 1980s, followed in 2004 by homestay-style lodgings near the beach, said So, a North Hamgyong Province People's Committee official. Together they have a capacity of fewer than 100 guests and only operate from April until early November. But even in this rustic corner of the country, the pressure to contribute to Kim's grand development scheme is keenly felt. As an indicator of Kim's success with Beijing, tourism from China is already on the rise. Pyongyang's longer-term goal, however, is to tap the South Korean market. The idea is that, if handled properly, South Korean tourism would present a chance to promote the North in a positive light and boost its image within South Korea. North Koreans stay at a homestay lodging near Mount Chilbo, North Korea. So said he believes Chilbo, like Kim's pet projects in Wonsan, could be a big draw for tourists. But he worries about where the money will come from and what might be lost. "Whatever we do, we need to protect the natural beauty of this place," he said. "I think there will be many changes in the coming years. Plans are being discussed. But nothing is decided."